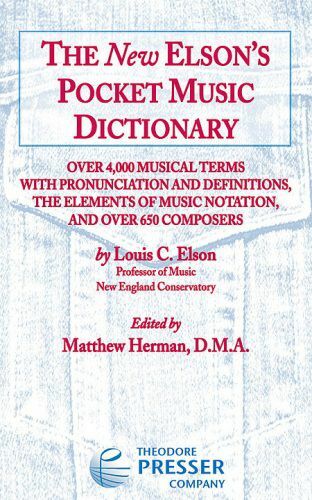 In the age of the Internet, Elson's Pocket Music Dictionary remained a staple reference for musicians of all kinds with its compact size, exhaustive range of definitions and composer listings. Theodore Presser is pleased to present the New Elson's Pocket Music Dictionary, updated to reflect the technologies and theories of 20th- and 21st-century music, along with an augmented composer list and the inclusion of jazz and contemporary music definitions. Now more relevant than ever, the New Elson's Pocket Music Dictionary will remain essential as a trusted and efficient resource for musicians.